The Two Medicine section of Glacier NP is found in the south-east section of the park, near East Glacier. It features the highest elevation lake that you can drive to in Glacier, namely, Two Medicine Lake. It is sometimes overlooked by visitors in the park, who prefer Going-to-the-Sun road and Many Glacier. Yet it is as scenic as anyplace in the park, and well worth a morning or two. There’s also a general store to the right of the parking lot. Two Medicine Lake is dominated by Mount Sinopah, which rises to 8,271 feet, about 3,000 feet higher than the lake. What I find perhaps most memorable about my three mornings at Two Medicine was the fact that I was the only one there. Yes, there were people at a nearby campground, and there are some private residences (for park employees) on the lake itself; but I was the only one out and about trying to photograph the stunning scenery. 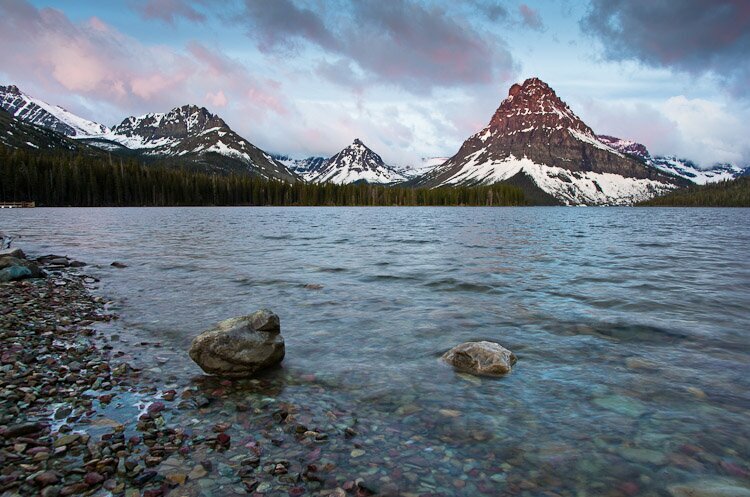 If you’re ever at Glacier National Park, don’t miss the sunrise at Two Medicine. Few spectacles are more splendid.